Personalized 2 Tone Folding Umbrellas Custom Printed in Bulk. Promotional, Budget Priced. Budget Prices in America. Bulk 2-tone personalized folding umbrellas with auto opening and matching color umbrella sleeves. Budget Prices in USA and Canada for wholesale folding umbrellas . American clients pay no taxes. We also supply blank (not custom imprinted) wholesale 2-tone folding umbrellas: please see the Price Table below. 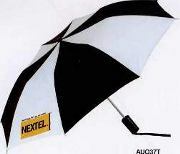 Unit prices include your 1 color custom imprint, or they are for blank (not imprinted) 2-tone folding umbrellas. Add $0.50 for each extra imprint color. Free artwork design. We will send you a proof for your approval before production. American clients pay no taxes. EXTRA IMPRINT COLORS: ADD $0.90 to the above unit prices per each extra color. EXACT PMS MATCH: $25.00 per color. PRODUCTION TIME: 5-7 days after art approval. Contact us for faster delivery. Blank (not imprinted) umbrellas ship next day. IMPRINT LIMIT: w x h: 6"x6"
ALTERNATING PANELS in 2 colors. COLORS: Black/White, Burgundy Red, Hunter Green, Hunter Green/White, Navy Blue, Red, Red/White, Royal Blue, Royal Blue/White. Other color combinations are available: contact us. 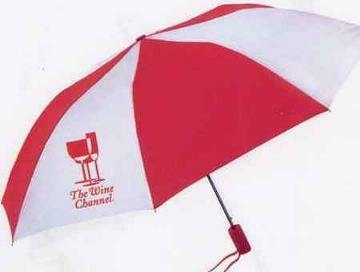 Check also our wholesale solid color personalized folding umbrellas . PMS COLOR MATCHING: Yes. Add $25.00 per PMS match.